Trust administration is similar to organizing your own finances. However, a trustee must create a trust account for every year of the trust’s existence. This account traces all the activity in the trust from the ending balances of last year’s account to the closing balances at this year’s end. This information will be communicated to the trust’s beneficiaries and the probate court. Trusts divide transactions between principal and income. 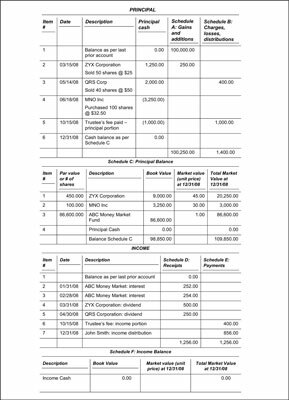 Although you can format them in a variety of ways, this figure shows a sample account in a form commonly used by most trust accountants. Schedule A minus Schedule B must equal Schedule C, and Schedule D minus Schedule E must equal Schedule F.
If all your trust’s assets are held by one bank, brokerage, or law firm fiduciary department, they should send you annual trust accounts. If you’ve scattered the trust’s assets among a variety of financial institutions, the responsibility of compiling all the information into one account becomes yours. Although annual account preparation may seem like a lot of work for little benefit, it’s important for a trustee to do every year. Not only do you pick up any inconsistencies in your recordkeeping this way, but you also create a permanent record of set points in the trust’s timeline. 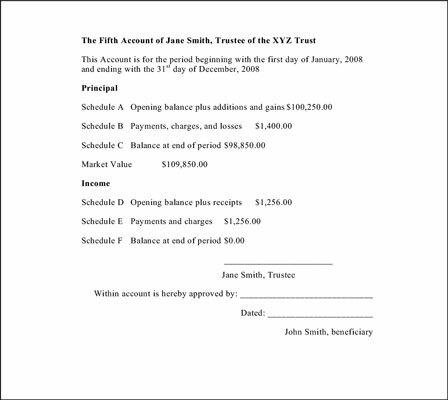 Sample annual account for the XYZ Trust. Click here to view this form. Once you’ve created an annual account, sign it and provide copies to all the beneficiaries for their assent. Prepare a summary cover sheet for the account, sign it as trustee, attach it to the six schedules, and provide a copy of the complete packet to the beneficiary. Include a photocopy of that cover sheet, which the beneficiaries then sign and return to you. Signed, these photocopies become the beneficiary’s assent to the account. After obtaining assents from all the beneficiaries, attach these signed documents to the front of your account, and keep the whole everything together in a permanent file. This figure shows a sample cover page, with the assent line included, for the annual account shown in the previous figure. Sample cover page for XYZ Trust annual account. Click here to view this sample. If your trust is governed by an instrument contained within the Last Will of the trust’s grantor, you may file annual accounts with the probate court. In most cases, the annual account format shown in the first figure should be adequate, but obtain the court’s specific guidelines. Instead of using the cover sheet in the second figure, use the court’s cover. Not getting pressure from the probate court to file the annual account doesn’t waive the requirement to file. Prepare and file accounts in a timely fashion; finding all the financial records you need years after the fact can often be difficult.